Robert Penn Warren has always been wedded to history, both in his novels and poems. He has always sought to understand the present through the past, or vice versa. What man is and what man could be, the mythology of the Self and "the awful responsibility of Time"--these are his themes. A radical in delineating the intensity of his own personality, and a conservative in his respect for and understanding of tradition, he brings together, when he is good, a compelling sense of the individual fate and the larger issues behind it, a feeling for the truth of his own subjectivity and anguish coupled with a heady insistence on the values of knowledge and moral definition, those transfiguring forces which give meaning to the dark and the isolate. Unfortunately, he is not at his best in his latest work, and his very commendable concerns often sound hortatory and hollow, Lucretius updated with existentialist heroics: "The world/ Is like wind, and the leaves clash. This knowledge/ Is the beginning of joy. I/ Tell you this explicitly as I can, for/ Some day you may find the information/ Of crucial importance." No poet should be that explicit, and the various colloquial echoes of Hemingway, Goodman, and Elizabeth Bishop, along with the prosy philosophy, tough guy ironies, parabolic settings and character sketches, as well as the general absence of striking phrases and enveloping rhythms, hardly help. 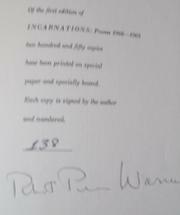 Warren still writes with great assurance, but "Night Is Personal" is the sole poem one can unreservedly admire.